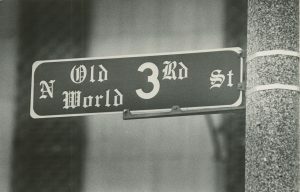 In 1984, the City of Milwaukee renamed different sections of 3rd Street as Old World Third Street and Martin Luther King Drive, reversing a simplification of street name rationalization initiated earlier in the 20th century. From the Historic Photo Collection of the Milwaukee Public Library. Courtesy of the Milwaukee Journal Sentinel. Reprinted with permission. 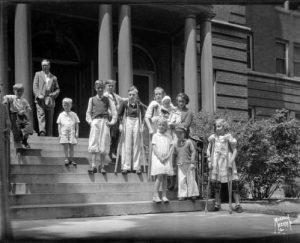 Children stand on the steps of the Milwaukee Children's Hospital in June 1936. Several of the children are using crutches. 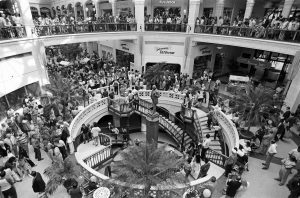 Constructed in response to suburban shopping mall development, Grand Avenue Mall opened in 1982. Pictured here are crowds gathered for opening day festivities. Photograph by Alan Magayne-Roshak. Copyright 2013. Reprinted with permission. Ordinance to Suppress "Houses of Ill-Fame"
Local officials have attempted to control prostitution throughout Milwaukee's history. 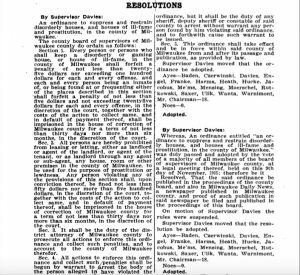 In November 1915, the Milwaukee County Board of Supervisors passed this resolution to "suppress and restrain disorderly houses, and houses of ill-fame and prostitution." From the Proceedings of the Board of Supervisors of the County of Milwaukee, 1915. Accessed via Google Books. 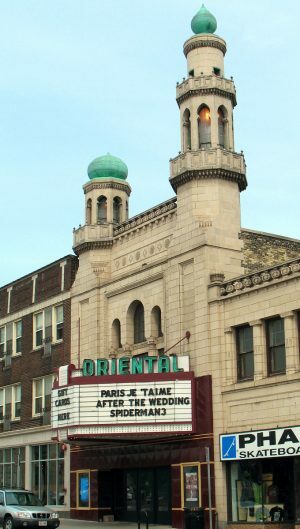 First opened in 1927, the Oriental Theater in Milwaukee continues to show films and offer patrons a unique movie experience. From Flickr. Photograph by Michael Newman. CC BY-NC-ND 2.0. 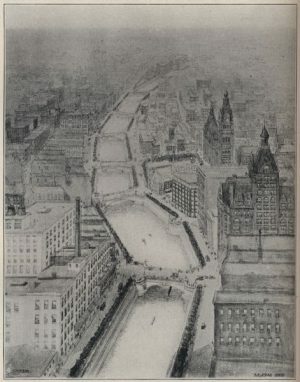 This 1904 sketch is Alfred Clas's initial design for Milwaukee's RiverWalk that did not see fruition until several decades later. From the Wisconsin Historical Society, WHS-135624. Reprinted with permission. 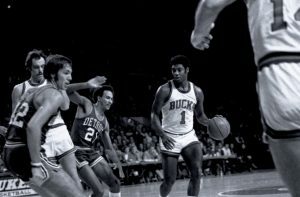 Oscar Robertson, star Bucks point card from 1970-1974, dribbles the ball against the Detroit Pistons. 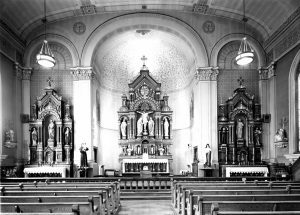 Taken in 1960, this photograph showcases the three altars located at the front of the Holy Trinity Our Lady of Guadalupe church. 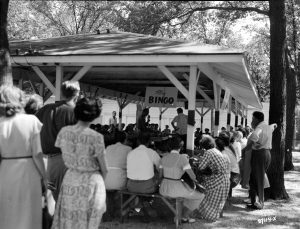 A group of people gather under an outdoor structure for bingo in 1950. Playing bingo for money, even for charitable purposes, was technically not legal until 1973. While Ozaukee County has seen increased suburban development in recent years, much of the county remains rural. 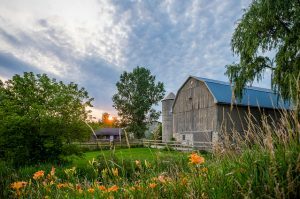 This farm is located in Cedarburg. From Flickr. Photograph by Nathan Hale. CC BY-NC 2.0. 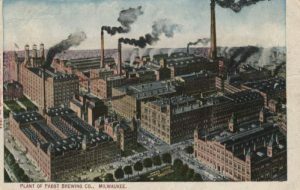 Postcard featuring the Pabst Brewing Company production plant. 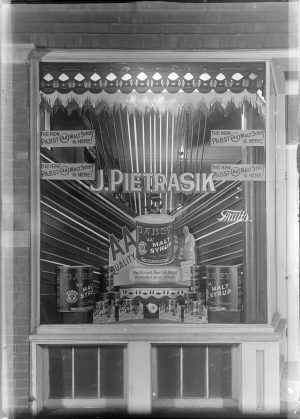 Brewers such as Pabst had to find alternatives products to sell, including hops-flavored malt syrup across the Polish South Side. 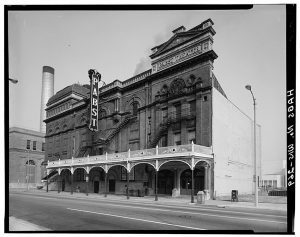 Exterior photograph of the Pabst Theater that is still used today, built after its first structure burned down in 1895. From the Library of Congress Historic American Buildings Survey Collection. 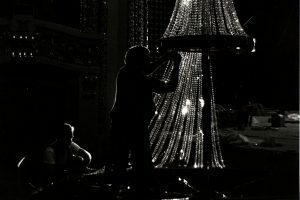 Hand stringing 33,000 inches of Austrian lead crystal for a chandelier in the Pabst Theater. From the Pabst Theater Collection. 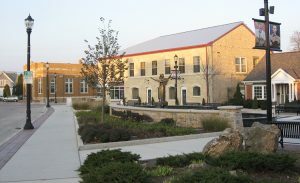 Archives, University of Wisconsin-Milwaukee Libraries. 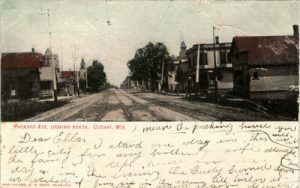 An early 20th century postcard of Packard Avenue, one of Cudahy's major streets. Until 1994, the Green Bay Packers brought football to Milwaukee and played three to four games at County Stadium each season. Accessed via Packerville, U.S.A. Photograph by Brian Anderson. Reprinted with permission. 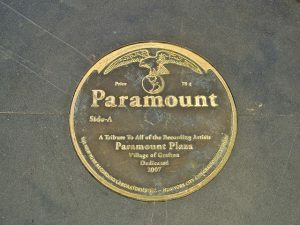 Paramount Plaza is a park in Grafton that memorializes the Paramount Record Label, which pressed its records in the village. A plaque in Grafton's Paramount Plaza. From Flickr. Photograph by Kenneth Casper. CC BY 2.0. 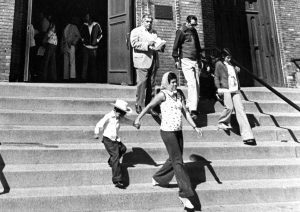 A group of parishioners exit Our Lady of Guadalupe after mass in 1975. 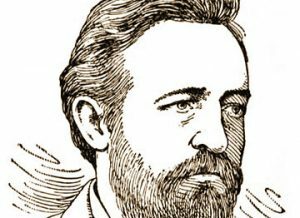 Drawing of Paul Grottkau, circa 1886, by Frederic Heath.